How to Recognize Quality in Tiffany Lamps | Antique Mosaic Glass Lamps | Skinner Inc.
Companies such as Duffner & Kimberly and Gorham, aspired to make lamps of a quality on par with Tiffany Studios, and created styles that appealed more to the Victorian taste that, though on its way out, was still the prevailing preference of the American middle and upper middle class. Wilkinson made high quality bases, and took short cuts with their shades. Many copied Tiffany’s Art Nouveau designs – in some cases almost to the letter – and many copied each other. Learning how to spot the best lamps could easily take years of study, since many pieces are not signed and the differences are often subtle between a quality lamp from this period and a modern reproduction. You also have to keep an eye out for “made-up” lamps, which are composed of both old and new parts. However, a few tips can help you start to recognize quality lamps. 1. Look for hairline cracks in the glass. It is not unusual for hairline cracks to appear in the panes of old mosaic glass shades. This is the natural result of the glass expanding and contracting as it heats and cools when the lamp is turned on and off. In fact, a lamp that doesn’t have any “stress” or “heat” cracks may be of more recent construction. 2. Pay attention to glass color. Look at the colors of the glass; are they subtle, saturated, bright, or soft? Overall, the colors should match in tone and intensity. If the shade has a “Crayola crayon” look to it – with overly bright or clashing colors – it could be of more recent construction, or have some replaced panes. 3. Pick up the base and feel the weight. Although the quality of workmanship and materials can vary greatly on these lamps, the best lamp bases are well-cast and heavy. Finer lamps will have cast brass or bronze finials, and bronze bases. 4. Step back and gauge the overall design. The shade and base should not only fit together properly, but there should be an overall sense of balance between all the design elements, from the finial to the base plate. The shades should have some complex elements of design or thoughtful use of color. 5. Talk to a reputable dealer, appraiser, or auction house. A reputable dealer or auction house will be familiar with these lamps and their attributes and will be happy to help you identify a lamp you own, or learn how to shop for a high quality antique mosaic glass lamp for your home. The Skinner 20th Century Design Department is an excellent resource when it comes to variety of examples of early 20th Century art glass lamps. For more information or to submit an appraisal request for your antiques, you can email at 20thcentury@skinnerinc.com, call 508-970-3111, or submit your inquiries online: Auction Evaluation Form. 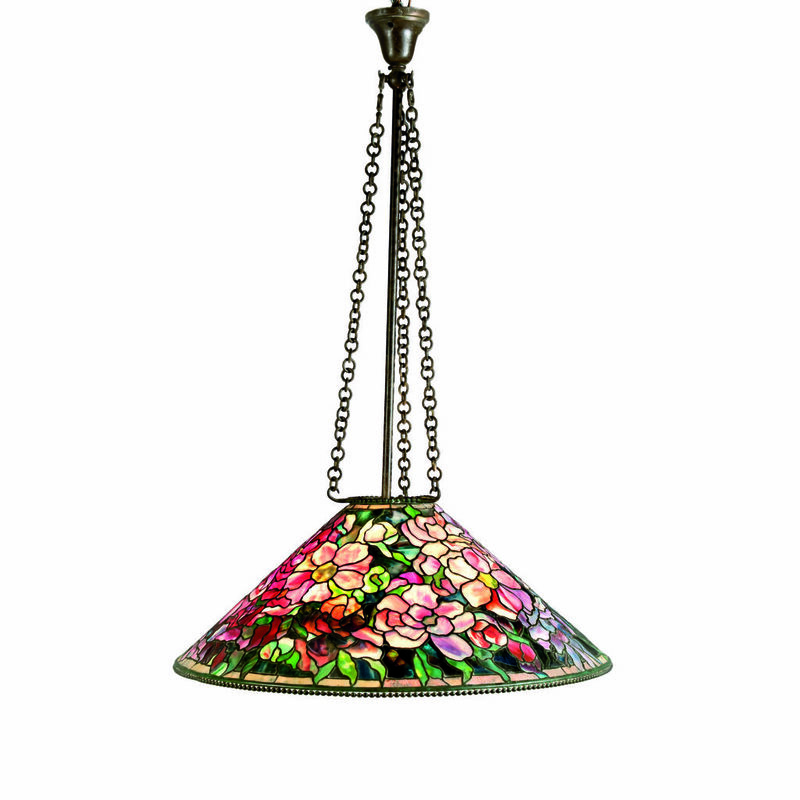 Antique Tiffany lamps remain the golden standard of mosaic glass lighting. However, that fact shouldn’t stop us from appreciating the well-designed, hand crafted, beautiful, and very collectible mosaic glass lamps by a wide variety of makers. All mosaic lamps are part of the fascinating story of early 20th century design in a newly electrified America. 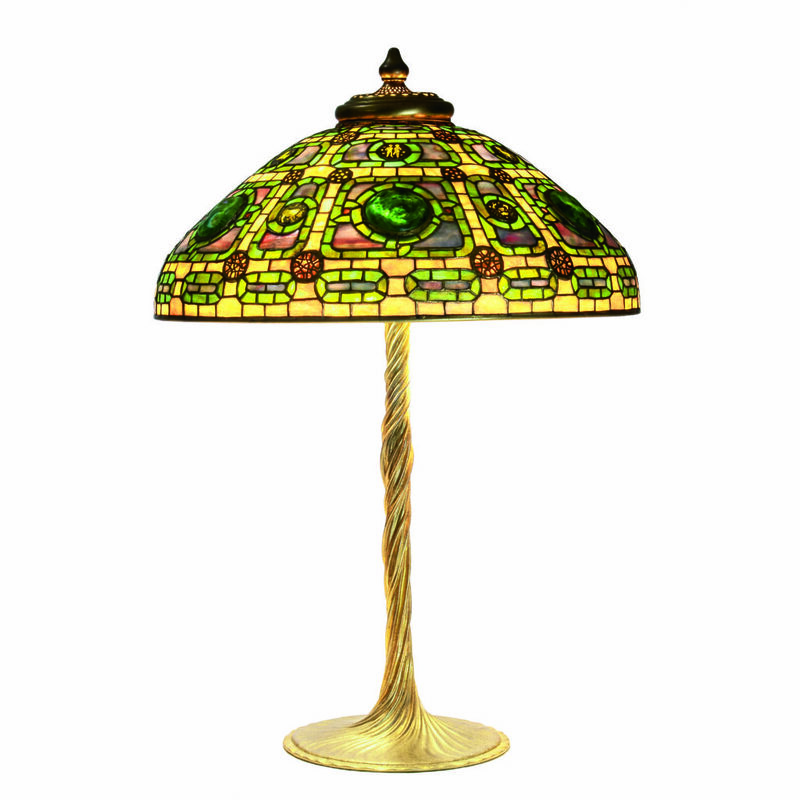 This entry was posted in Blog and tagged 20th Century Design, antique tiffany lamp, art nouveau, duffner & kimberly, early modern lighting, gorham, lighting design, mosaic glass lamp, original tiffany lamps, real tiffany lamp, Shannon Ames, tiffany style lamps, tiffany table lamps, value of a tiffany lamp, victorian, wilkinson by Jane Prentiss. Bookmark the permalink. Pingback: The Value of Mosaic Glass | Antique Tiffany Lamps | Duffner & Kimberly | Gorham | Skinner Inc.
Do the Wilson, or Duffner & Kimberly, lamps have “Tiffany” labels or marks in the shades or bodies? Do obvious counterfeits carry phony labels? Thanks for your inquiry. 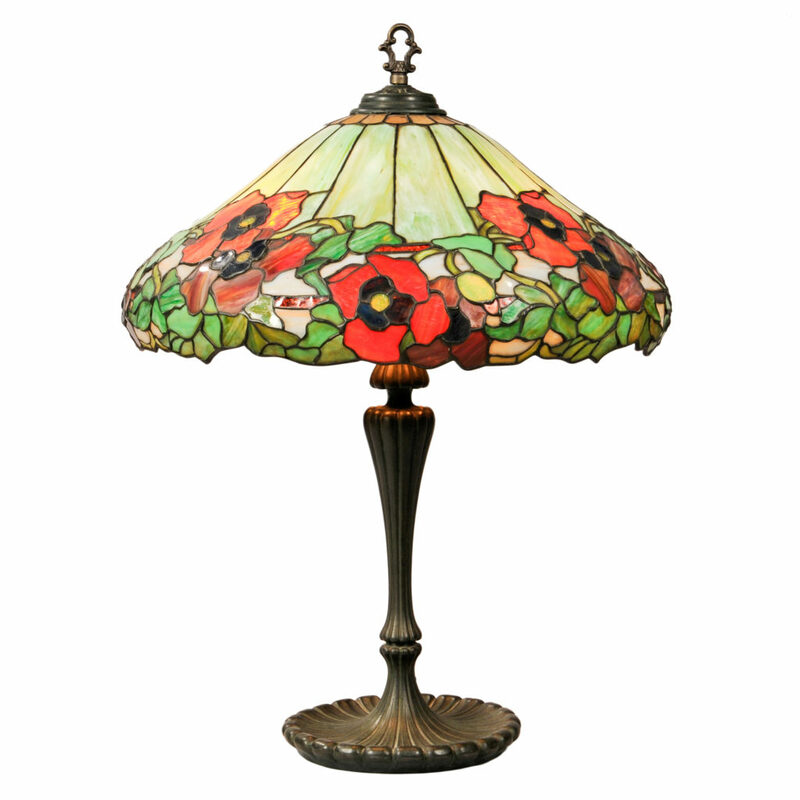 Because Tiffany lamps – when they are right – can be very valuable, there are people who might add a spurious Tiffany Studios label to a lamp shade or base by another maker, such as Wilkinson or Duffner & Kimberly in an attempt to increase the lamp’s value. Sometimes it can be easy to spot a fake label or mark, but more sophisticated forgeries can be harder to identify. If you have questions about a lamp or its label we would recommend seeking an expert appraiser’s opinion. Do Tiffany lamps ever for any reason have hubbell sockets? Thank you. The lamp may have had the sockets repaired or replaced. Hubbell was a large dealer during the period. I have a beautiful stained glass hanging shade which would be used over a dining or kitchen table. I have had it for 40 years and it was old when I received it. It has beautiful green leaves, dark red grape bunches and a gold back ground. Is there a way I could tell the value? It is quite large and heavy. Thanks. 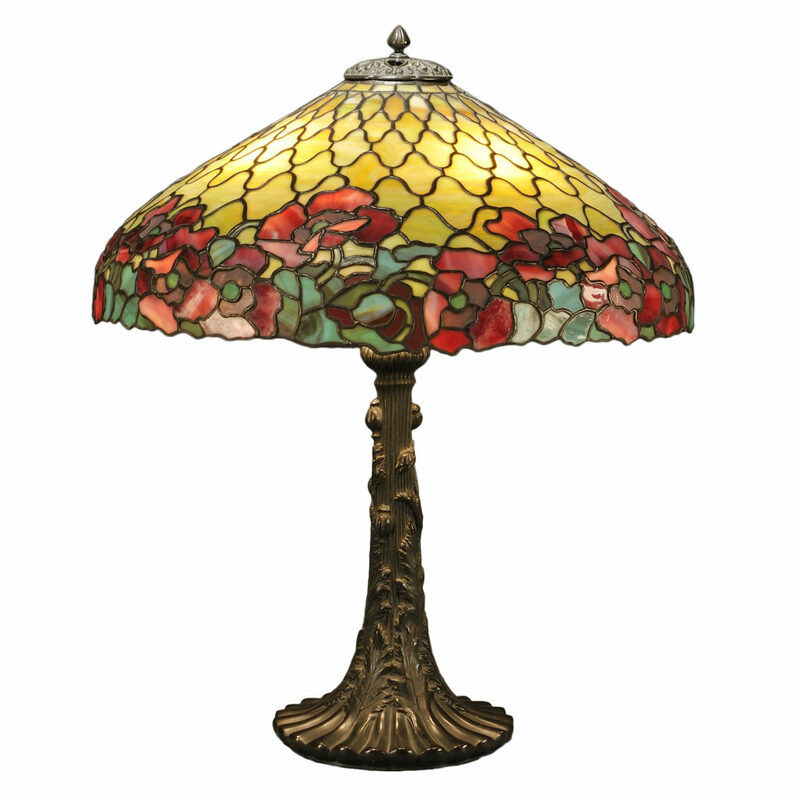 To find out what your stained glass shade may be worth at auction, please submit photos and a description along with your contact information to 20thCentury@skinnerinc.com. No, the design for each lamp determined the direction. I would go to the library or bookstore and get a good book on Tiffany Lighting. Most period books are out of print, so you could try a used bookstore. Learning about the components of Tiffany lamps requires seeing all the models they produced and creating a check list for each model. It’s much more complicated than other mosaic glass makers and more lucrative to fake. In summary, the answers cannot come with a single response to each question; the lamp must be observed as a whole. I live in Atlanta Georgia . Are you aware of any HONEST people to contact? I do not know of any reputable dealers in your area who specialize in lighting. If you are trying to find out about a specific lamp, we may be able to help. Please take photos of shade, base, and cluster sockets. Note the diameter of the shade. Please note markings on the shade and base and provide photos of those as well and send everything to 20thCentury@skinnerinc.com. We can see if we can assist from the information. Skinner specialists would be happy to take a look at photographs of the lamp shade to assist you with an estimate of the value at auction. Please submit photos and a description along with your contact information to 20thCentury@skinnerinc.com. The Appraisers Association of America’s website can help you find a dealer in your area. my mother in law recently moved and had an old glass chandelier that was removed from another relative’s house many years ago. we live in an old house so she thought we might want to use it to keep it in the family. unfortunately while showing it to my wife, she forgot about the chain and it fell breaking two of the curved glass panes. It’s about 23″ across with white and “orange” streaked glass. i can’t find any markings on it and the wife is interested in finding out what it is and if it is possible to fix it without breaking the bank. any help would be appreciated. i would be glad to upload pictures to someone. Thank you for the comment. I’ve sent you an email. I received as gift a Tiffany Style Night-table-lamp-shade only. Now I have a project to do: Where can I search for the lamp-base and the round cap. Thanks for the comment, Peter. I’ve answered via email. How to check the quality of the glass Mosaic tiles, there are any International standard ? You need to know where the tiles came from and determine the quality of the glass. On unsigned pieces, determining quality requires developing your eye by looking at correctly documented pieces and making a comparison. This is not a skill that is quickly learned. I emailed some pictures of a lamp I found in my grammas house. Inside the shade is attached what looks like a metal piece. Did Tiffany label their lamps in this fashion? If you receive my email the pic of the metal piece is blurry a bit so I couldn’t read it. I did see a hairline crack on the inside of the shade. The base is very heavy. Thank you for any help you can afford me. I recently purchased a hanging chandelier that was advertised as a real Tiffany light. Its big,floral and heavy. I Just got it so i havent been able to inspect it. Some of the cabachon glass pieces red have fallen off. Can you use super glue or do you need a special glue?. Even if it is not Tiffany, i love it anyway. I plan to put it over my dining table. What kind of light bulbs do you use? I am sorry if my questions are silly but I really don’t know about this subject. Thank you for your help. When I looked on line for hanging Tiffany lamps all I got was table type lamps. Thanks Kim. 40 watt bulbs. Take it to a lamp restorer. Super glue does not have the correct expansion coefficient. The glue will cause more problems because it will not allow the material to expand and contract with hot and cold temperature fluctuations. I have a hanging glass lamp that I believe dates to the 1920’s. It came from the house I grew up in, which was built as a summer home for a wealthy family. The lamp is simple in design but has a lovely geometric pattern which complements the chain on which it hangs. Colors are soft white and amber only. The simplicity of the design makes me think it’s not a Tiffany but I would be interested in learning more about it. I live in Vermont now, though the lamp came from a house in Maine. I have no idea where to get more information. Thank you for your interest. I will forward your inquiry to our 20th Century Design specialist. In the meantime, please use our auction evaluation form to send images for evaluation: https://www.skinnerinc.com/selling/sell-at-auction. Friend has what appears to be stained glass table lamp. Very heavy, but when thumped sounds like plastic not glass. many colors very close together and the base looks like plastic wood? where can I find out what this is? thank you..
Hello, I’ve two lamps that possibly might be Tiffany lamps. They are from at least the 70’s, and maybe older but that’s hard to investigate for us. Can you please mail me so I can send you some pictures. Hi Marco, Skinner’s Appraisal Department would be more than happy to assist you in finding out more about your lamps, please submit photos and an auction evaluation form via our website: https://www.skinnerinc.com/selling/auction-evaluation-form/ or contact the Appraisal Department directly at 508-970-3299 or appraisals@skinnerinc.com. Thank you! It there a reputable company near Washington, DC, to which I could have look at this chandelier? Do you have any thoughts on who made it. I believe it was made before electricity was widely used in homes due to the brass jets, which appeared to be for gas. Hi Schalene, Skinner’s Appraisal Department would be more than happy to assist you in finding out more about your chandelier. Please submit photos and an auction evaluation form via our website: https://www.skinnerinc.com/selling/auction-evaluation-form/ or contact the Appraisal Department directly at 508-970-3299 or appraisals@skinnerinc.com. Thank you! I recently purchased 2 lamps from a thrift store. They are tiffany style. Bronze heavy bases. On is Lily pads. One lamp has a Stamp of C L on the lamp plate. Thats is all I know. Any advice?? I HAVE 3X3 SETS OF TIFFANY STYLE LAMP SHADES WHICH HAVE NEVER BEEN USED. THEY ALL HAVE A NUMBERED PLATE INSIDE THE TOP METAL PLATE EMBEDDED IN THE LEADWORK , HARD TO SEE REALLY . I AM SELLING FOR A FRIEND AND WOULD LIKE TO KNOW JUST WHAT THEY ARE . 1 SET IS THE DRAGONFLY , RED EYES , REDDY BROWN WINGS , MOSTLY GREEN WITH TWO LINES OF YELLOW BROWN WHITISH COLOURED GLASS ALONG THE WIDEST PART OF THE SHADE . ANY INFO WOULD BE GRATEFULLY ACCEPTED …. Hi Dave, Skinner’s Appraisal Department would be more than happy to assist you in finding out more about your lamp shades. Please submit photos and an auction evaluation form via our website: https://www.skinnerinc.com/selling/auction-evaluation-form/ or contact the Appraisal Department directly at 508-970-3299 or appraisals@skinnerinc.com. Thank you! 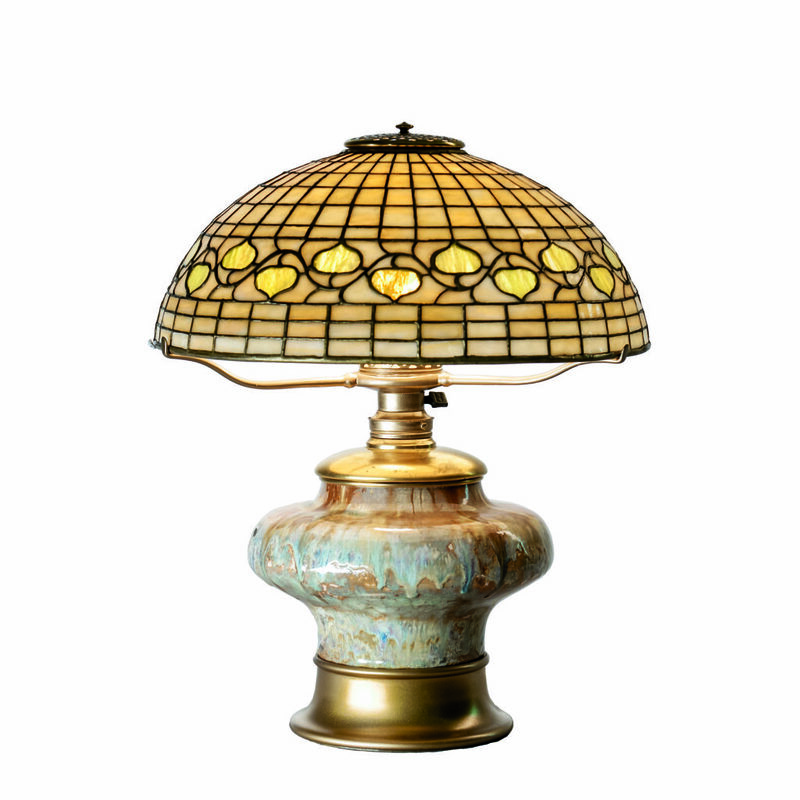 I have an art glass lamp with an ornate bronze base that is in excellent shape. Would you be able to help me identify th maker is I sent photographs and measurements? Than you for any consideration. I have an antique leaded glass lamp shade which I know nothing about, except it has been in our family for many, many years. The glass appears to be slag and the metal appears to have been painted black, however it looks like it may be brass underneath. Can you tell me anything about this lamp. There are no marking to be found.How can I send photos to you? Now it is easier to spot the quality difference in Tiffany and Mosaic stained glass.